Sylvan used a 2' x 4' sheet of 1/4" ply ($7 from Lowes) for the 84HP 9U Studio case. Looks fine with no overhang. And they did the rest. Charge for cutting was US$87. Pics and info on the thingiverse page of his make. $93 for the 84HP 9U Studio Case from Polulu. Seems like I could get that cheaper elsewhere, no? I got a quote back from Pololu on the 84HP 6U 93mm case - ¼" birch for $48. 3 day turn around. Only thing is their wood selection is limited. I'm partial to the amber bamboo so I'm going to figure out Ponoko before I pull the trigger. I agree that the cost will be more than Pololu. I might need to move around the layout to work with their sheet sizes - I don't know if they'll do that for me.. We'll see. At this point, I feel I've been on this long enough to see it through and share the Ponoko quote (and hopefully a working Ponoko file). Their design upload feature is making my New Year's resolution to quit smoking 1000x harder. Are there any exact measurements on any of the files? I'd rather try and make one using some type of hardwood, since I don't have access to a laser cutter, but I do have access to the very well equipped woodshop in my school. Might edit the design a tiny bit to combine the 3U acryllic and the 6U upright cases. Are there any exact measurements on any of the files? If you pop them open in sketchup then click the measuring tape tool on the left, you can measure each piece/edge/whatever. Don't even need to know how to use the program to do this. As expected, it's twice as expensive than Pololu since two sheets are required (Ponoko has smaller sheets). I'll attach the .eps files if anyone wants to give it a try themselves. If I were making a 3U skiff, the bamboo would only require one sheet and would be similar in cost to the birch from Pololu. But I'm doing 6U and 2x the cost isn't justifiable IMO. Since I like the darker color and contrast of grain in the amber bamboo over birch, I was wondering if the middle ground here would be to stain the birch plywood.. I work in software, not wood. I've done some research into staining but I'm wondering what people's thoughts on this are. Is this going to affect the spacing of the joints? Etc. I spent hours trying to get the Ponoko files working and it has exhausted me... Any guidance is much appreciated. 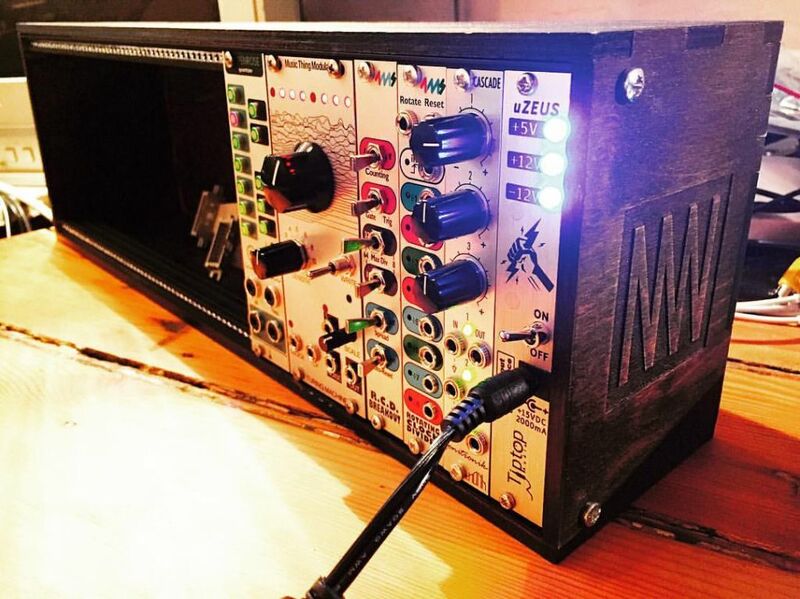 Has anybody tried this project with Tip-Top / Z Rails? According to this thread (which is very informative!) the hole for the Z-Rail mounting screw is 0.5mm lower than the hole on Gie-Tec / Doepfer rails. Can anyone confirm that the first screw in Elby Rails is the same depth as Gie-Tec / Doepfer rails? They are sadly not represented in Daverj's awesome diagram in the above linked thread. The other difference I can see would be that the screw holes are probably a bit too big for M4 screws. This is a fairly easy change as I just have to change the hole diameter from 2.5mm to 2mm. I'm also not sure whether that 0.5mm will really create any major issue? I'm guessing if I just change the hole diameter the rails will be just 0.5mm higher in the case than originally designed...which may or may not be annoying? If anyone has tried this with Z-Rails - did you alter the mounting screw depth / size? If not, is the rail height / depth an issue? If no one has tried it I think I might be the guinea pig and rework the hole depth and size for tip-top / z rails. After messing around in Illustrator for a little while I think I've been able to update the 9U studio case for Titp-Top / Z-Rails and M4 screws. I'm waiting for the final pieces to be cut / shipped. For 1/4" Birch Plywood @ Venture Laser in Philadelphia it was $15 for the wood and $60 for labor / laser cutting. $75 all in. They're super cheap - £6 for a 2 metre piece - and fit square M6 nuts. The only downside seems to be that they don't have the gubbins at the bottom which allow you to screw in from the side to fix them to the box. I was thinking it would be fine for the top and bottom as they could just be screwed into the front and top of the box. For the middle ones I was considering using a bracket similar to the one pictured above, bolting them together, then screwing to the side. Alternatively I could run a piece of wood to join the sides, then screw them to this. The problem would then be I might have to jiggle the dimensions to acccount for it and I don't want to mess it up! Any thoughts? These people are in the North East of England (actually just around the corner from me by chance! ), but they might deliver. These might actually be the wrong size - I'll have to compare them to the dimensions of the vector ones when I get home. Do you take commission for case designs? I'm looking for a 5 row (15u) x 104 hp case. Wrong size - they are the brackets for the sides of the case, to hold the enclosures, not the rails for the top and bottom, to hold the panels. It's just for the 9U studio version and still set for 7mm ply. It's an Adobe Illustrator (CS4) file. I can try exporting it for older versions of Illustrator or as an EPS file if anyone needs another file type. Be *really* careful with the glue if you intend to stain..or just stain all the pieces before you glue...or you'll have to do a ton of sanding for the ply to take on the stain well. Kreiff that's absolutely ace! Great work! 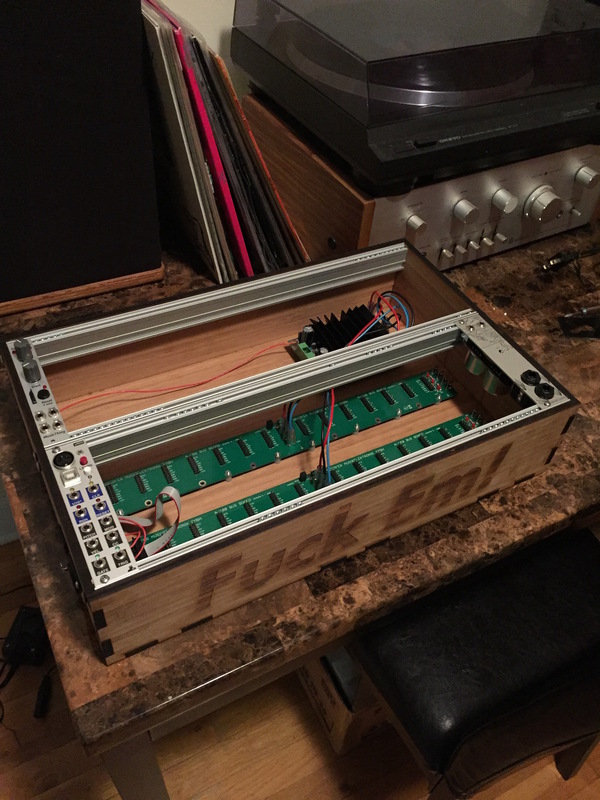 I've been looking at these designs for the last few weeks and been thinking about modifying the 3U case for the TipTop Z-Rails myself (as it's my first foray into modular synths - thought I probably should start small!). I was also bizarrely planning on staining it walnut as well so it's great to see how it turned out. I was wondering if you could provide a little more info on how you did this so I can modify the '84HP 3U 93mm' design. I've converted the .dxf into .eps so I can modify it in affinity designer (vector graphics AI alternative).. I've done a pretty dodgy work around by matching it up to your spec by eye but not sure that'll be good enough - so yeah if you could let me know how you were able to modify it to fit the Z-Rails and M4 screws that would be hugely appreciated. For the screw holes I changed the diameter of the holes from 5mm to 4mm. You need to be very careful to maintain the center point of each hole. The holes in Nathan's original design are not actually circles. They look to be traced in by hand and at very high resolution are very jagged. I used Adobe Illustrator and created a square around each screw hole in the original design. Illustrator will find the center point of any vector shape and I could use that center point as the basis for the new hole. The mounting screw in Z-Rails are really only 0.5mm higher than the mounting screws in Elby rails. I really wanted the rails to be flush with the wood at the top - so I linked all of the screw holes horizontally and just moved them all uniformally back by 0.5mm. I had mentioned before that I might edit and upload some of the other design files for Z-Rails - if you can wait until this weekend I can work on uploading an edited version of 84HP 3U 93mm design then. But by all means - take a stab at it if those measurements will help you edit it on your side! If you could take a little look and check if it's correct that would be super helpful and very much appreciated! Hey mwmw - glad you gave it a go! I don't have Illustrator on my work PC - but I'll take a look when I get back home. If it looks good I'll upload it as a new remix and give you credit. 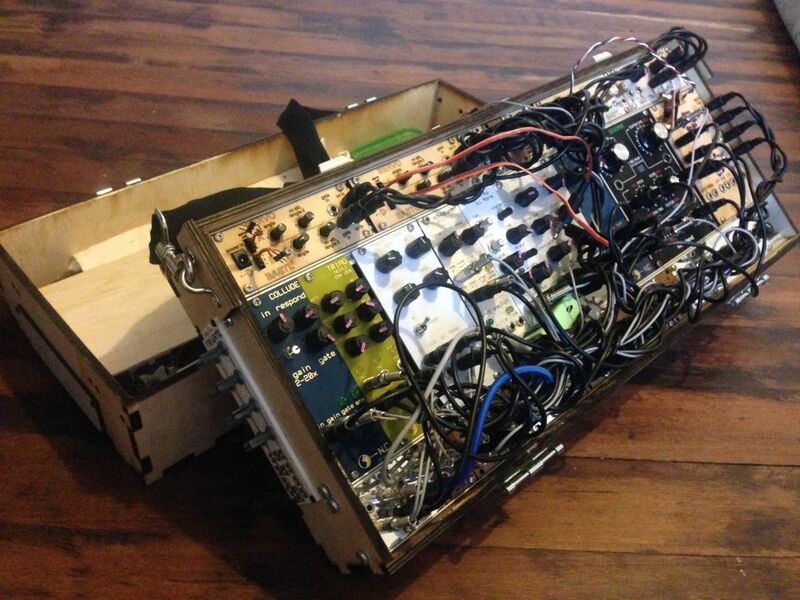 I think the 3U boat / Skiff will probably get more DLs than the 9U Studio - It's a great starter case or an alternative to the TipTop HEK given that it's less than $10 worth of ply. Hey mwmw - Sorry for the delayed reply! When I imported your EPS to Illustrator it was showing it 25% bigger than the 93mm measurement - I've had issues converting EPS files to illustrator in the past though so that just may be a quirk between the software you're using and illustrator. The other thing I noticed was that the horizontal position of the screw holes was off a bit. One side was correct, but the other was off by a couple millimeters. One is an illustrator file and one is an EPS file. Either of those should work for you. I noticed that your screw holes were like 3.988mm as opposed for 4mm on the dot - but that shouldn't be an issue. Definitely within tolerance. And you got the depth of the screw holes dead on! Definitely post your build once you get it all cut and glued! Thanks so much for your help!! It's very much appreciated . I'm super happy how it came out. I stained it dark oak and put a couple layers of dark oak varnish on it as well. Thanks again for your input. It's been the most enjoyable and rewarding project I've done in ages... now to make some music! Some great work here, Im happy to see some use of these files. Decades ago we used to just screw down into lengths of 10mm or 20mm wood glued to the inside of the case, really cheap but after a while the wood would get chewed up from changing modules around. Ive developed a system that allows you to switch out the wood when its old. My local hardware sells a length of 10mmx10mm pine for $2 which is enough for a 84hp 3Urack, this cant be beaten for value. I will finalise the design, take pics and upload the files to the thingi page in a few days, will post back here to let you know. Hey mwmw - Happy to help! It came out really nice - The etching in the side looks sweet!